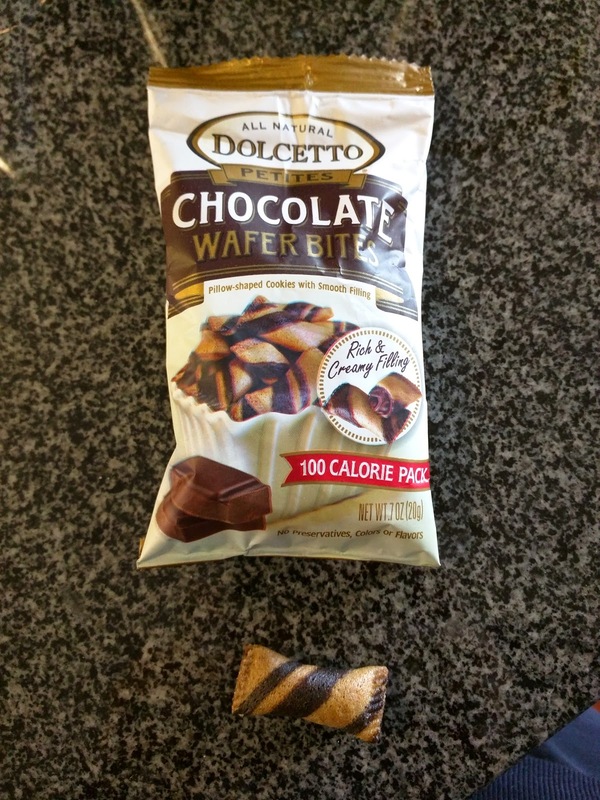 Dolcetto is sorta a one trick pony, specializing in a variety of wafer products, starting with classic layered wafer squares filled with chocolate, vanilla, or even "tiramisu", aka, coffee, cream. Slightly more interesting are the wafer rolls, like thin cigars stuffed with chocolate, vanilla, tiramisu, or cappuccino cream. Their final product is "petite wafer bites", in classic chocolate, lemon, or cookies and cream. I tried the wafer bites. Dolcetto means "little sweet one" in Italian, which, pretty much sums up what this product is. Little sweet things. They were enjoyable, probably great alongside a coffee. "Filled with velvety molten chocolate, each bite-sized cookie offers a unique balance of crisp and creaminess." I didn't really expect to like this, as I thought they would just be like little cookies, and I'm not really a big cookie person. I figured I'd try one, and hand my package off to Ojan. Spoiler: he didn't get any. These are hard to describe. The outside reminds me of a waffle cone, and the inside is a soft creamy milk chocolate. Not "molten" as they claim, but certainly "velvety", and really quite good. I loved how satisfying it was to munch on these individual bite size pieces. So yes, stepping back, they were basically little ice cream cone pieces filled with chocolate. Sorta like what you want the tip of a Drumstick ice cream to be, but, even better. Speaking of ice cream, the packaging also recommends freezing them. Which, given my comparison with a Drumstick tip, makes total sense, so I quickly froze my next package. I didn't like it as much this way, since the creamy chocolate center was part of the appeal, and, it was no longer creamy once frozen solid. I'm not really one for BBQ, since I don't really like pork or chicken, and they are usually the focus at BBQ joints. Yet, I went to Cathead's BBQ. Why? Well, not for the actual meat, obviously. But there is a part of BBQ that I absolutely love: the sides! Cornbread or biscuits, potato salad and cole slaw, baked beans, mac and cheese ... I love them all. I'll always eagerly tag along to get BBQ, even though I never intend to really eat the main attraction. A friend has recommended Cathead BBQ a number of times, and their menu, while it features all main dishes I wasn't interested in, also includes a ton of amazing sounding sides. All the classics, but amped up a bit. The biscuits come either in mini form, or "as big as a cat’s head", served with honey butter and pepper jelly. The potato salad has dandelion greens added. The mac and cheese has pimento for a bit of kick. People rave about the collard greens, and they are just greens! And Cathead has not one, but two types of coleslaw, something I'd been really into, since trying out the versions from Fresh Express, of all things. For my first visit, I swung by just to get a side of slaw to bring home to have with a picnic themed dinner I was planning. I didn't spend much time inside, but it was a very casual, comfortable feeling place. Everyone orders at the register in the front, seats themselves, and orders came up on the counter when ready, your named called out. There were a variety of tables options inside, and a few picnic tables outside as well. Super casual, so my ordering takeout was totally acceptable, I wasn't sure how showing up just to get some slaw would go over, but it was no problem. Service was incredibly friendly. On my first visit, when I asked about the difference in the two slaws, one called "mustard" and one called "habanaro", I was immediately told that one was mayo based, and the other vinegar, but that I should just try them both. Moments later, little cups of each were held out to me. The person ordering after me asked if the pimento mac and cheese was spicy, and again, in moments, a sample was provided. Wonderful service! I returned several more times to pick up sides to take home to complete other meals I was planning, and was fairly impressed, but I don't really think I'll return further. That said, I fully recognize that I didn't actually have their BBQ, which is sorta the whole point, so I can't really judge..
As I mentioned, on the first visit, I tried both the habanero and the mustard slaws before deciding which to order. The habanaro was vinegar based, super fresh, the cabbage incredibly crispy, and it had a bit of heat from the habanaro. 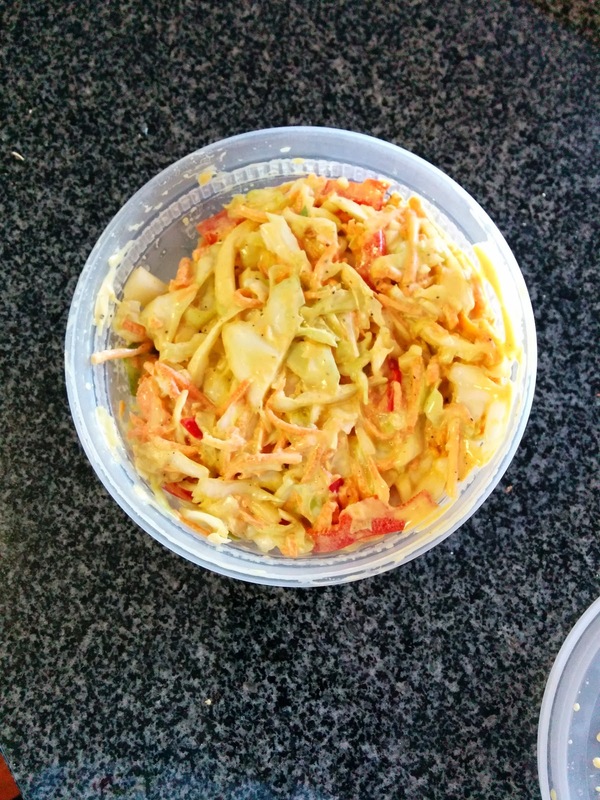 I really liked it, but I am much more of a fan of creamy coleslaw, so I went for the mustard slaw instead. I was intrigued by the idea of mustard slaw. I don't think I've really had mustard in slaw before, but Cathead is known for their sauces, vinegars, and mustards, so, it makes sense that they would feature it in the slaw (you can buy their sauces in bulk too, more on them later). The dressing for this slaw was thus both mustard and mayo based, although not super creamy. Like the habanaro slaw, the cabbage was incredibly crisp, all green cabbage. There was also shredded carrot and red pepper in the mix. All fresh and crisp, the slaw clearly hadn't been sitting around for ages and was freshly made. Points for this, as soggy slaw is sad slaw. 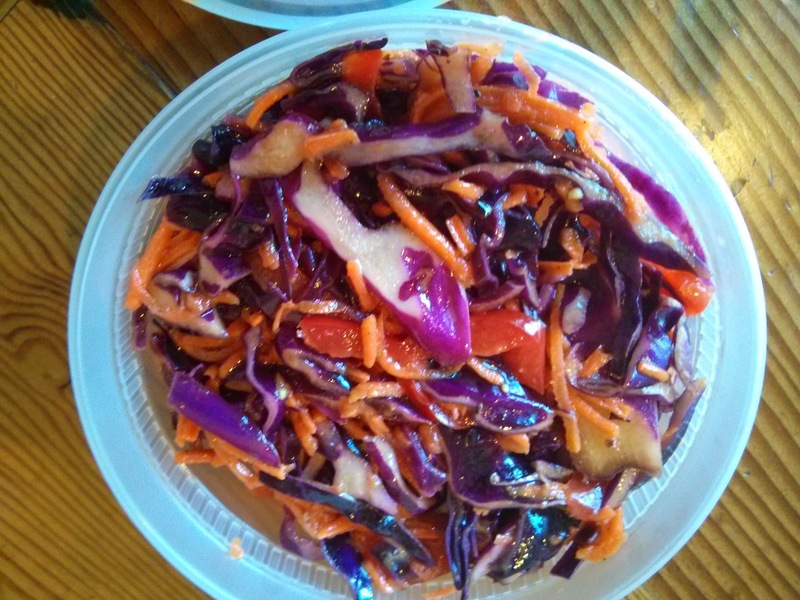 The mustard slaw is the less spicy choice between the slaws, but it still packed a punch. Without something like mac and cheese, or I guess ribs, to go alongside, it was actually a bit too spicy for me. The mustard did add a zing, but I think I prefer standard mayo based coleslaw. The slaw was all perfectly executed, but just not my style. All sides are $4 for a side portion, which is quite a bit of coleslaw, it easily could be 3 small servings alongside a meal. I'm glad I tried mustard slaw, but I wouldn't get again. On my next visit, I decided to get the Habanero Slaw, since I didn't care for the mustard one very much. It was made with red cabbage rather than green, but had the same shredded carrot and red pepper. It was the vinegar based option, rather than mayonnaise. The veggies were crisp, and it had some serious heat, but I really am just not a vinegar slaw type. I brought it home to Ojan who was also sad that it wasn't mayo based, so we added our own mayo to it. Problem solved, except, it was still too spicy for Ojan. If you like spicy vinegar slaw though, go for it, it was clearly a good product, just not for me. Pimento Mac & Cheese. $4. On my next visit, I again wanted to just pick up a side dish, this time to go along with the sausages I had ready to grill from Rosamunde. I thought potato salad would be a good fit, so I asked about the Dandelion Green Potato Salad. I was told that it was German style (boo), but that it did contain mayo (yay). A sample was immediately presented the moment I inquired about it, without my asking specifically to try it. I'm glad it was, because I didn't end up liking it. I certainly prefer even more creamy, mayo-laden, American styles. This was tangy German style, with harsh red onion, and mushy potatoes. I prefer my potatoes a bit al dente in my potato salad. I did like the mustard greens in it though, a fun southern twist. But not my style of potato salad overall. So I took things an entirely different route, and picked the mac and cheese. I didn't ask to try the mac and cheese, or ask about how spicy it was, but just went for it. I'm sure I could have asked for a taste, but I decided not to, not wanting to be extra work when I was just picking up a single side. I wish I had. The mac and cheese, like all of the sides, is pre-made, sitting hot in a steam table behind the counter. It wasn't very creamy. Nor very cheesy really. The pasta was a bit mushy. Just overall, quite unremarkable. The pimento did add a fun kick though. $4 for a reasonable sized size was fine, but I wouldn't get this again. And finally, I had to try the BBQ baked beans. They were served warm, out of the steam table like the mac. The beans were loaded up with lots of caramelized onion. The sauce had a deep molasses flavor, and the right ratio of sauce to beans, not too dry, not to runny. The beans were tiny bit mushy but not too bad. I don't really like beans in general, and got these mostly for Ojan, but I did appreciate the flavor of the sauce. 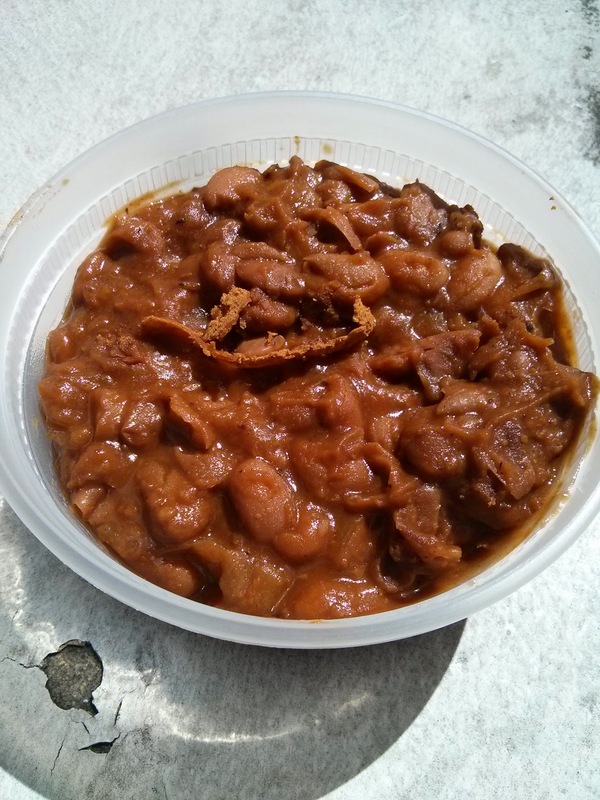 Very good for baked beans, due to the excellent sauce and plentiful onions. Cathead's BBQ is known for their sauces, and on one visit, a set was included in my bag, when I mentioned I was pairing the mac and cheese with some sausages. How thoughtful! I was excited to try them, since I knew they are part of Cathead's fame. 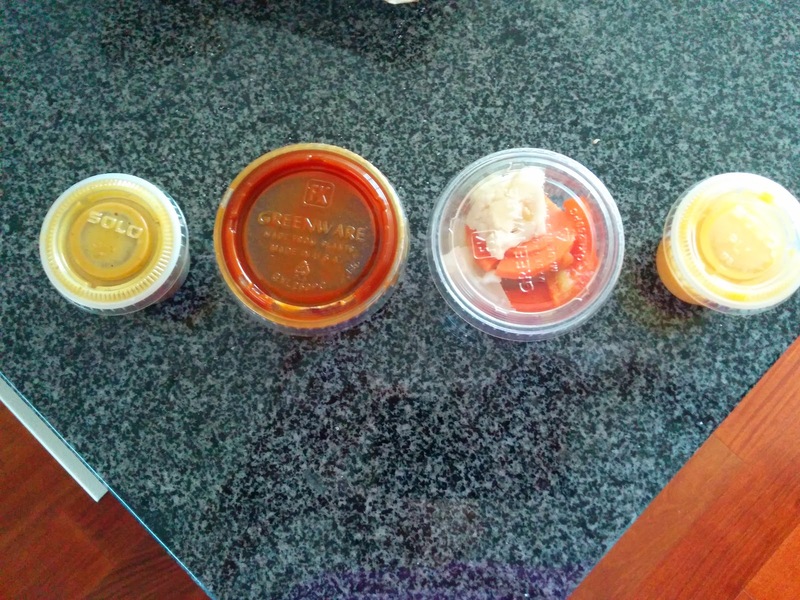 My containers were (from left to right): mustard, BBQ sauce, pickled veggies, and habanero hot sauce. 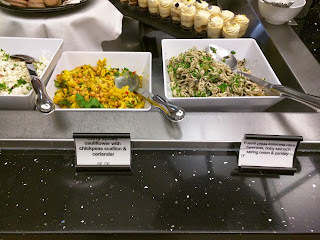 The mustard, which I had in the mustard slaw, is described as "a blend of mustard, black pepper, and cider vinegar." This was a thin style mustard, far thinner than any mustard I've had before, not really appropriate for spreading on things like hot dogs or sausages, but makes sense for use with bbq. The pepper was particularly strong. The BBQ sauce is described as "ketchup based sauce, mixed with brown sugar, molasses, and cider vinegar. This sauce is your 'put it anything you want bbq sauce on' sauce." The brown sugar and molasses were quite obvious in it, certainly a sweet style bbq sauce. It did have some good additional spicing however, a bit smokey even? Not just sweet. I enjoyed it with some cornbread, and if I liked chicken, I actually think it would be perfect for chicken. The pickled veggies included carrots, cauliflower, red peppers, and onions. Basic vinegar pickle style, crunchy, and tangy. I'm sure they go great with bbq. The habanero hot sauce was in the other slaw I tried, described as "a well balanced spicy and flavorful hot sauce". When I had it in the slaw, it was obviously in a small quantity. When I generously dipped a pretzel into this, I had no idea what I was getting into. Holy crap it was spicy. Punch-you-in-the-face spicy, but, once I got over the initial shock, I actually kinda liked it. It didn't linger in a horrible way, just in a pleasantly spicy way. As you read about last week, my recent journey to Sydney went a very different route this time around. Rather than fly on Qantas through LAX, I flew with Air New Zealand for the first time, with a connection in Auckland. 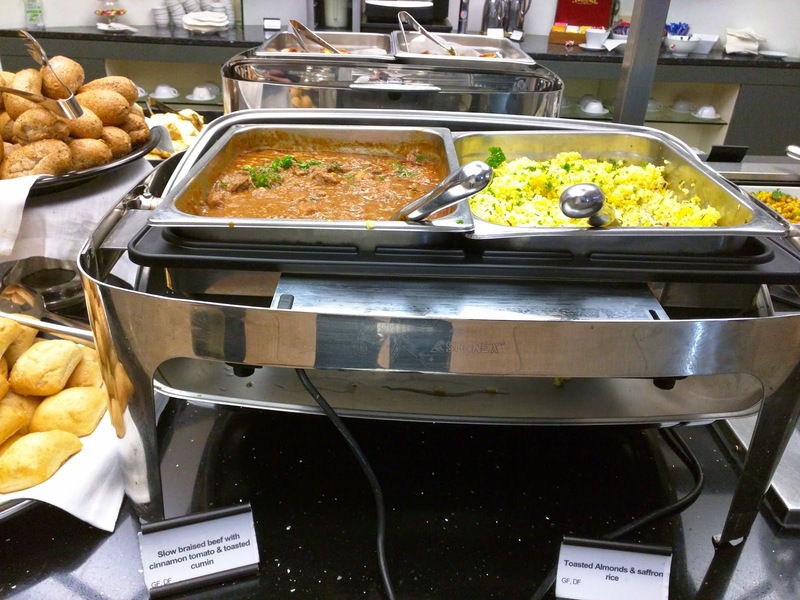 I was obviously less than impressed with the Singapore Airlines Kris lounge they use in SF, but, that is par for the course in SFO. I've been to some really, really incredible airline lounges at this point, which you can read all about. I have expectations for a lounge, particularly when located inside the host country. 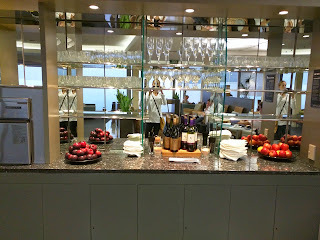 The Qantas First Class lounge in Sydney is still my absolute favorite, nothing compares to the incredible food quality at the restaurant there, and the full service spa. 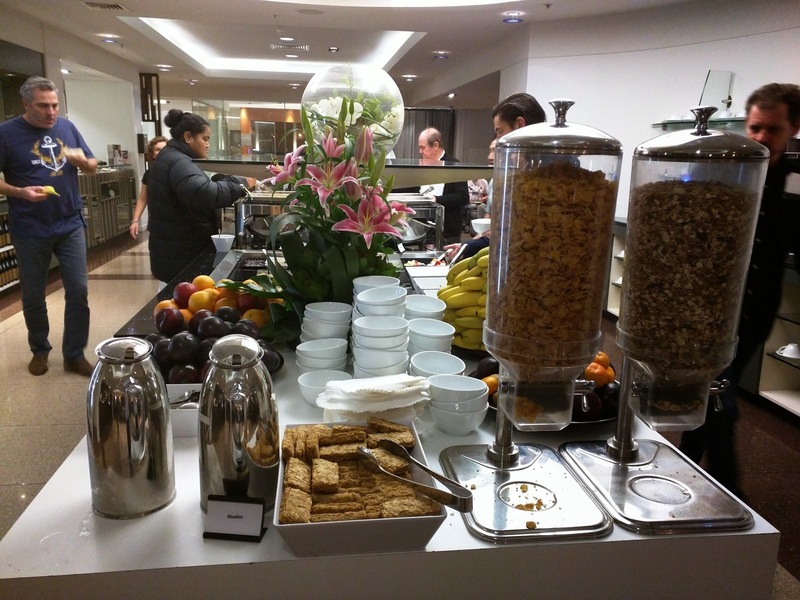 Just having a real restaurant in your home base doesn't equal success though, as I didn't love the breakfast or lunch at the swanky Concorde room in Heathrow. 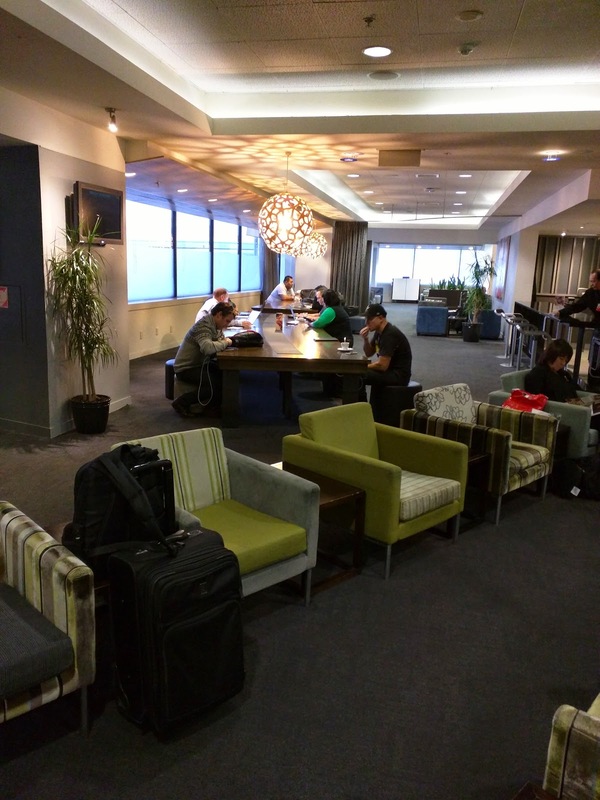 Just being Qantas doesn't equal success either, the brand new Qantas First Class lounge in LAX didn't measure up, even though it tried. 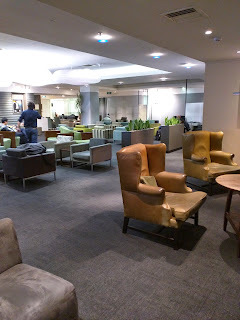 The assorted lounges at Cathay Pacific's home base in Hong Kong do come close though, I loved my private cabana, and the vast food options, including better dim sum than I have had in the US. To be fair, this is a mixed class lounge, so perhaps I should be comparing more with the Galleries business class lounge at Heathrow, which had a much better spread too. 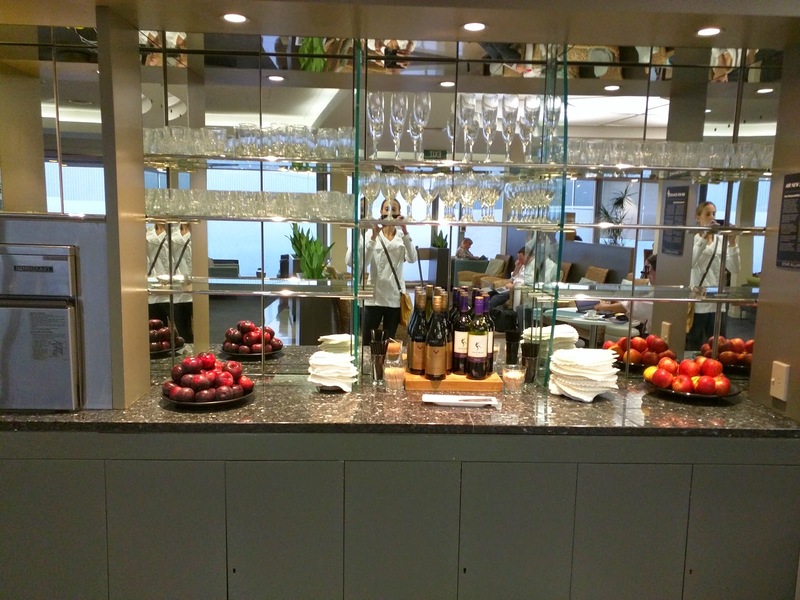 I had no idea what to expect from the Auckland lounge, although I know it is the Air New Zealand flagship, so it should be more impressive than one outside the country, which it was. I got to visit the space twice, once on my fly to Sydney, early morning, around 6am. Ouch! My next visit was on my return, at a far more reasonable 5pm hour. 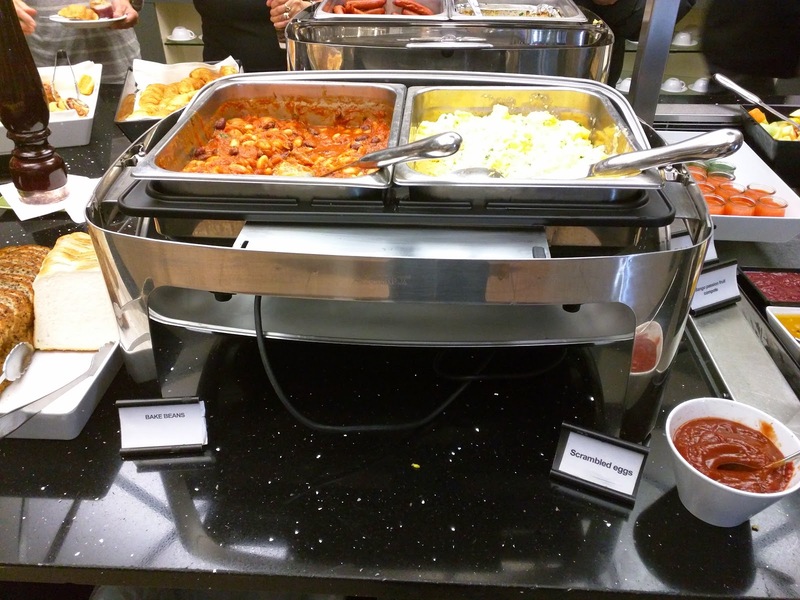 I'll review the general space first, then break down into the separate meal services. Overall though, a nice spacious lounge, but clearly not a premium product on the level of British Airways, Cathay Pacific, or Qantas. 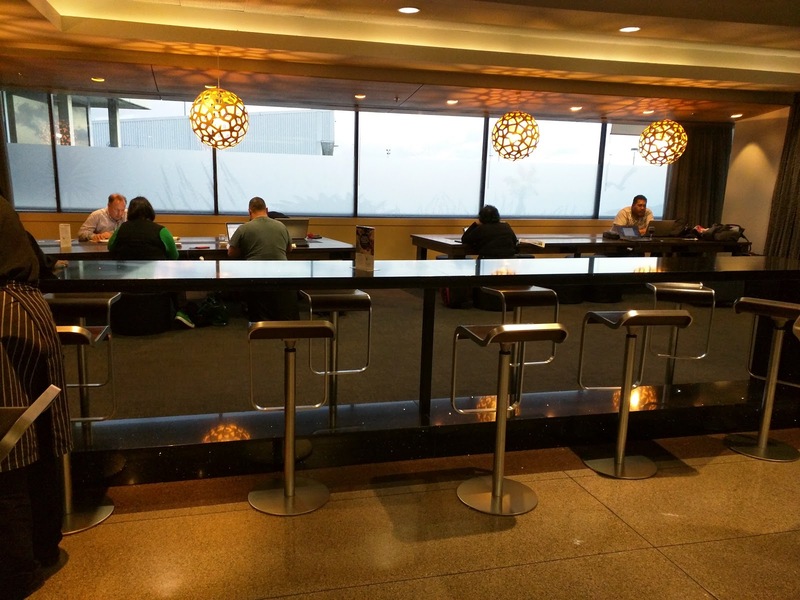 During both my visits, the lounge was certainly active, but there were plenty of seats available of pretty much every type, even close to power outlets. 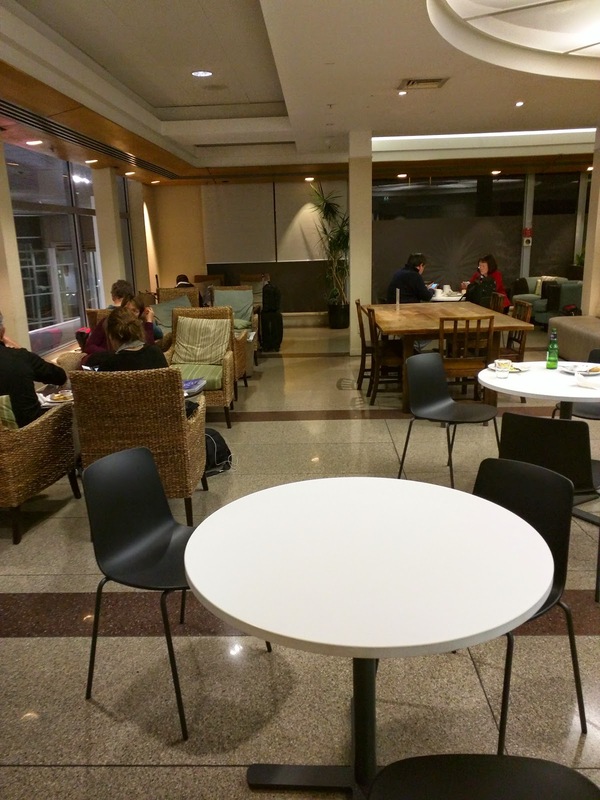 There were people all around for sure, but, the lounge space is really quite large, and broken up in a way that just feels expansive. To say that seating options are varied is an understatement. 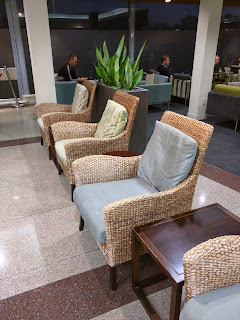 If you can't find a seating style you like in this lounge, I'm really not sure what you are looking for. For those who like a high perch, there was a high table with stools all along it. The stools didn't look super comfortable though, so this wasn't a pick for many folks. 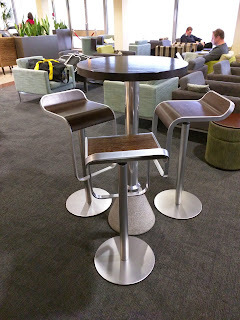 The same stools came perched around little round tables too. I actually choose to camp out at one of these, but I used the stool just to put my bags on, not to actually sit. 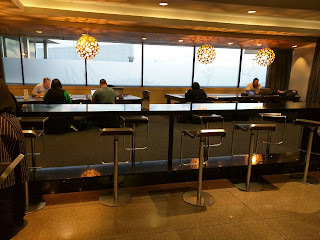 The tables were at perfect standing height, and after a long flight, standing was exactly what I wanted. Easy to eat, or type away on my laptop at these tables, even though I may have looked silly standing at the table? 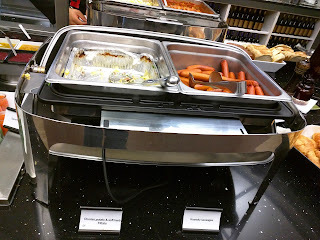 Except of course that they were right next to rather cafeteria style white plastic tables. And a gorgeous wooden communal table. The space planner made some interesting choices throwing these all in the same space. Another large communal table was a big hit with the worker-bees, presumably because the cards with the wifi password were all on it (wifi worked fine, by the way). Adjacent to work-ville were more standard soft chairs, where Ojan set up shop. Even softer chairs were around the corner. 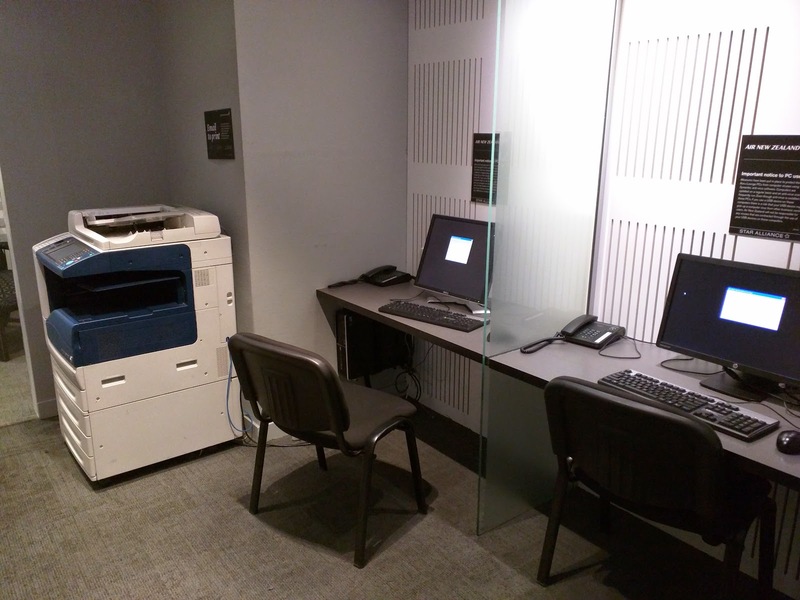 And a small business station with computers, printer, copier, etc for those who really wanted to pretend to be at an office. 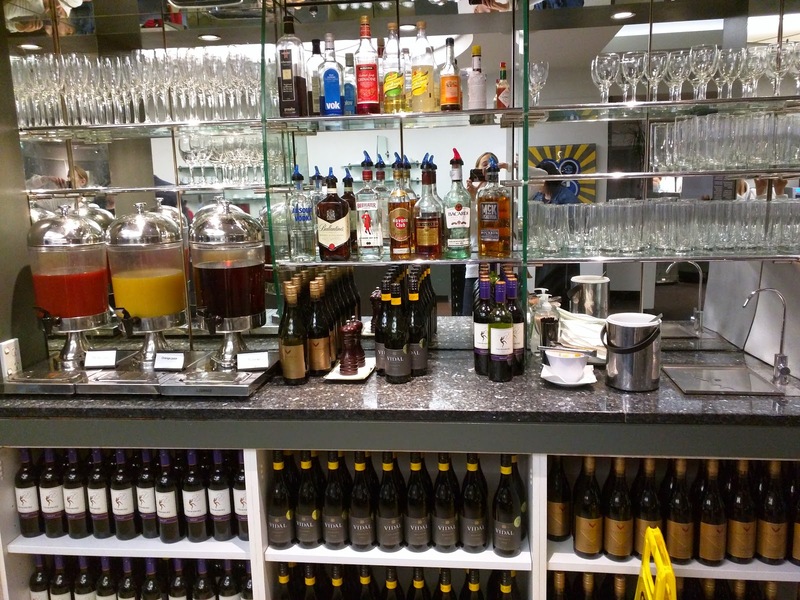 Coming off a long overnight flight, on my first visit, I was ready to do one thing: DRINK. 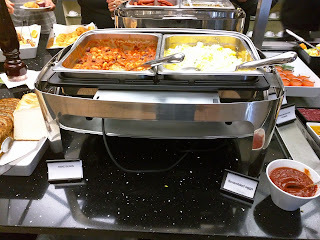 Of course, it was early morning, and I was crazy jetlagged and dehydrated, so, the alcohol options were lost on me. I wanted water. I wanted coffee. 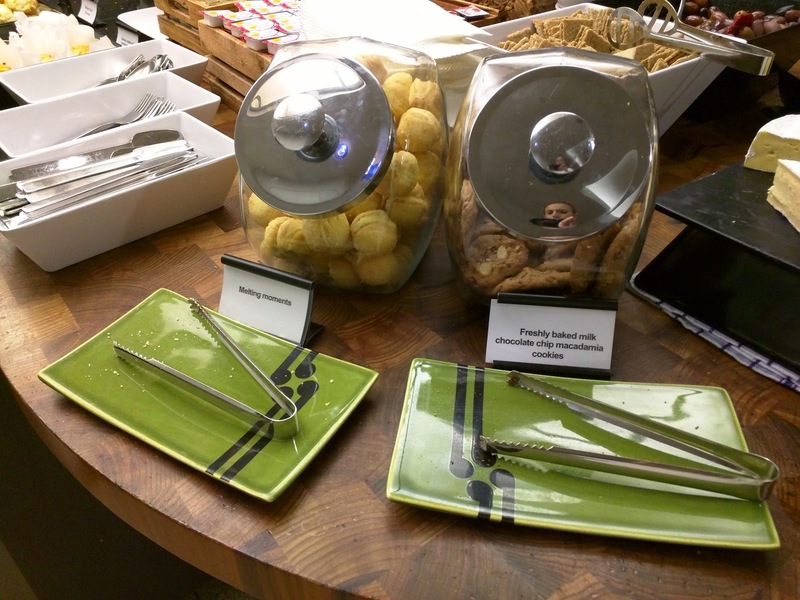 Luckily for me, the lounge had plenty of those things, and, on my return afternoon visit, I was able to check out the more fun options too. The moment I saw a barista station, I made a beeline for it. Caffeine! Caffeine! And, even though I saw a very busy barista and a slew of drinks lined up, there was no line. How could this be? Do people not like coffee at 6am??!! No, they just had an awesome ordering system. You just walk up to a tablet, put in your name and order, and it gives you an estimate of when your drink will be ready. Then you are free to go take in all the other attractions. You can specify if you want it for there or takeaway to dash out the door, which I always appreciate. It even gives you a picture of your drink as you build it, showing a short drink if you select a single espresso, a fuller one if you select a double, etc. I loved the ordering process, as it was simple and efficient, and never involved a human, avoiding language issues too. I got a simple long black, takeaway, since I had very little time, and figured I'd just grab it to bring on the flight. It arrived within the 4 minute quote I was given. It was fine, but not remarkable. 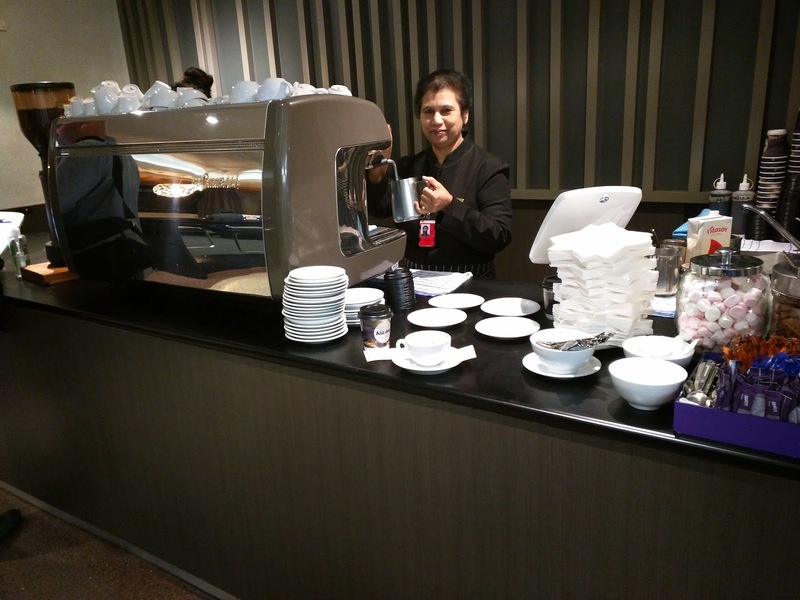 I appreciated the takeaway option, and always hate lounges that never have togo cups, as I often want to bring a coffee with me onto the plane. I couldn't resist trying one of the cute little marshmallows available at the pick up spot, and I'm glad I did. Fluffy and soft, and I really quite liked it. I grabbed a few more for the road, er, sky. 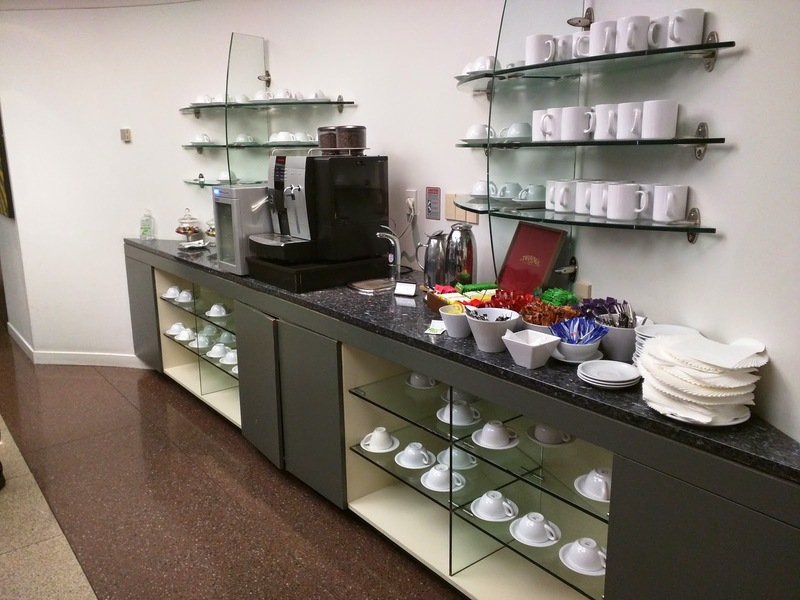 I could have also just taken matters into my own hands, and visited the self-serve hot drink area. 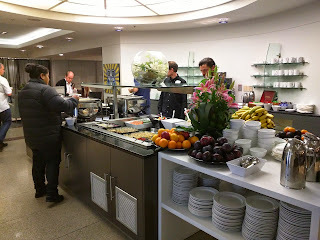 It featured an espresso machine that also made lattes and cappuccinos (but didn’t contain decaf). Instant decaf and hot chocolate mix were available, along with a mix of assorted teas and sweeteners. I appreciated the hot water tap here, rather than a kettle, or any other cumbersome technique for getting boiling water. Another nice example of efficiency. Juice options were basic apple, orange, and tomato juice, which served dual purpose as breakfast drinks, or mixers. I didn't try any. 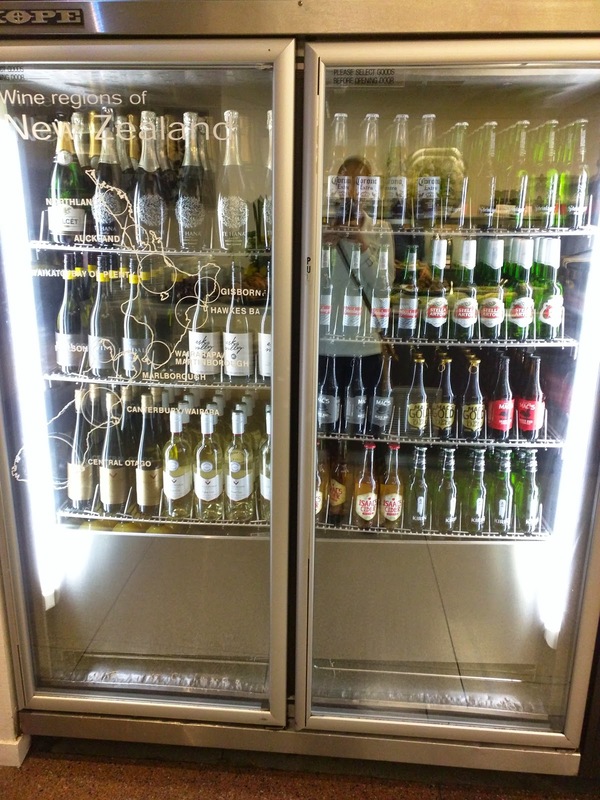 A cooler was filled with beer, cider, white wine, and sparkling wine. 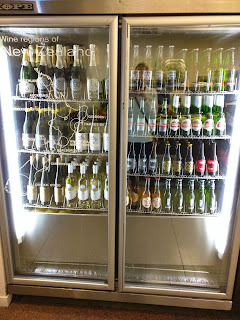 I was surprised to find cider, but, cider was much more prevalent in Sydney too. Since I don't like beer, I always wish the US had more cider options! I did try one of the white wines on my second visit, but, it was acidic and not very good. Red wine, spirits, and other mixers completed the bar area. On my return visit, I had a glass of the pinot, which was shockingly drinkable, and I really quite enjoyed it. Definitely higher quality than expected in the lounge, and, compared to the white. The barista area, and all the other drink stations above are all adjacent to the food area, but around one corner is a small side bar. It had a second coffee machine, a few bottles of red wine, and some fruit. I'm not sure I saw anyone use it. As I mentioned, my first visit was in the morning, around 6am. I had less than 45 minutes in the lounge, and had just come off a flight that served me breakfast, and knew I was getting another breakfast on my next flight, but ... you know me. I needed to try the things, particularly since I love breakfast food so much! We had limited time, but I was determined to at least sample some of the food offerings. 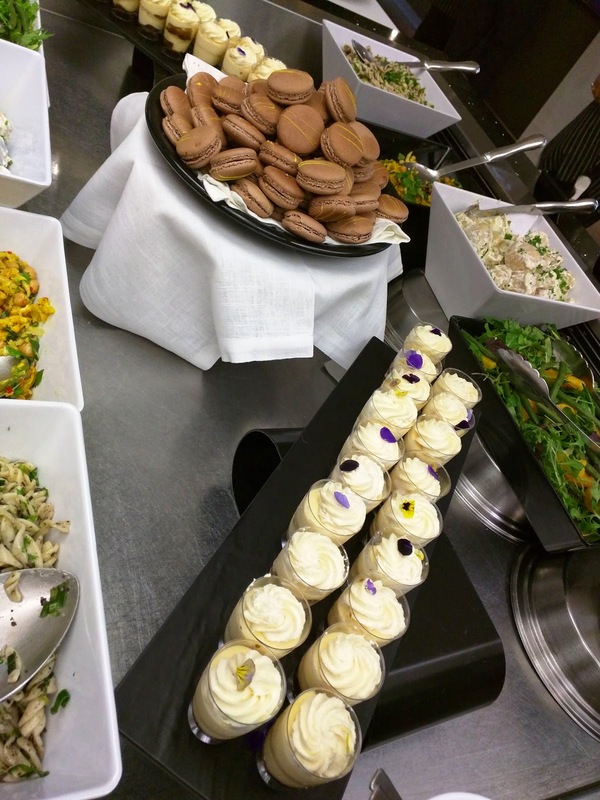 The food was all arranged in one large area, with the beverage stations around the outside, and the food around the middle. The buffet started with cereal in dispensers, pitchers of milk alongside. One looked to be something like cornflakes, another a light muesli, but they were not labelled. Next to them was Weet-Bix (which was actually labelled). Whole fresh fruit was also in this area, including oranges, plums, bananas, and oranges. Bowls of these fruits were also located in the second drink area on the other side of the room. The fruit all looked pretty good, and Ojan said the plum was better than he expected. 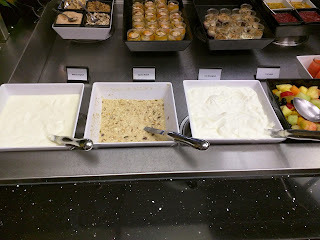 Next came yogurt (natural or low fat), Bircher muesli, fruit salad, and some fresh juices. I skipped the yogurt, and admired the fruit salad only from afar. I didn’t see any watermelon, to which I’m severely allergic, but, past experience has taught me that even if I don’t see watermelon in fruit salad, it very well could have been there at some point. 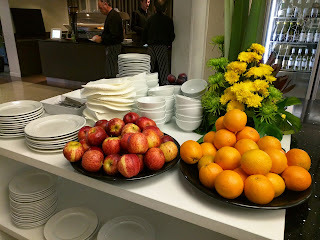 The fruit looked really quite good though, all fresh looking, not brown (particularly impressive with sliced apples! ), and there were even blueberries. I do adore Bircher Muesli though, so I had to try that. It was ok, a bit loose and not quite as creamy as it sometimes can be, as in, it didn’t seem to have tons of yogurt in it (which was fine with me, I actually don’t like it when it gets too yogurt). It had a good amount of dried fruit and seeds in it. Overall, fine, and if I was hungry, I would have been quite satisfied to load up a big bowl of it with some toppings. 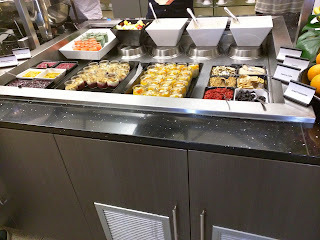 The backside contained toppings for the yogurt, along with pre-made pots. Dry toppings were banana chips, dried cranberries, granola, toasted almonds, goji berries, and a powder. Only 4 of the 6 items were labelled, so I'm not sure what the powder was. I didn't try any of these. They were really inconsistent with the labeling! Wet toppings were 3 compotes: mango passion fruit, rhubarb and red berry, and a third mystery one. Again, the labeling! I tried all three on top of my muesli. The mango and passionfruit one I thought would be my favorite, but it didn’t have much flavor at all. I really didn’t taste mango, nor passion fruit. 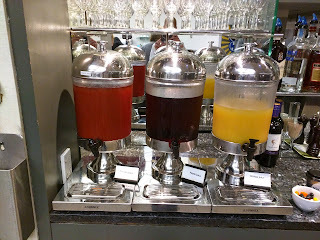 The rhubarb and red berry was sweet and ok, but not remarkable. The third was my favorite, fresh and fruity, and I wish I knew what it was. Between the toppings were little pots of pre-assembled parfaits. The one on the left looked to be the rhubarb berry compote, topped with yogurt, topped with granola, which I could easily have made myself, so I skipped it. The other drew me in though. The bottom seemed almost to be like the bircher muesli, but it was thicker, less creamy. Perhaps just a different batch, but it seemed more like overnight oats than muesli? I’m really not sure. The compote on top of this however was totally delicious. I know there was stewed apricot, but there were other items I couldn’t identify, plus a sprinkle of coconut. I really enjoyed this topping, particularly with some of the cream from the pancakes! A large variety of sliced breads were available, and seemed to be a quite popular option. The staff were constantly replenishing this area. Ojan opted for a simple slice of toast, as he wasn’t feeling great, and we did just have breakfast on the flight. I thought it was a bit funny that they had both a conveyer belt style toaster and a regular toaster. Do people really have that strong of a preference? Now we were getting into my favorite stuff: baked goods! 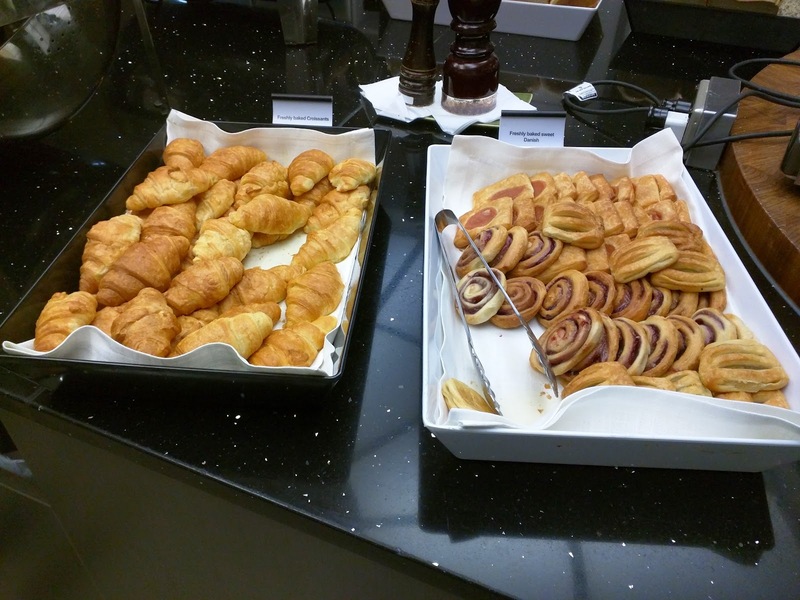 One basket contained what claimed to be “Freshly baked croissants” and the other “Freshly baked sweet Danish”. The croissant basket was just plain croissants, the other basket had a variety of pastries, including some fruit filled danishes and what looked to be fruit swirls. While I do love my baked goods, I actually skipped these because they didn’t look very good, and, I wasn’t actually hungry (remember, this is breakfast number 2! ), just curious to try things. I had to limit my choices, and there were plenty of better looking options. 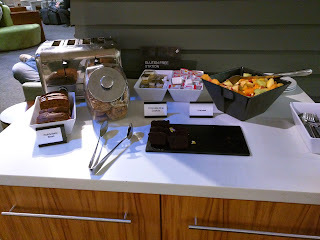 Interestingly, no muffins nor scones, these were the only pastry items. 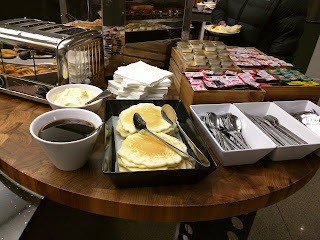 Pancakes, cream, syrup, spreads for toast. 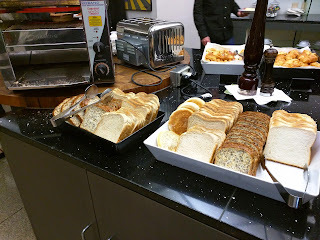 Along the backside, between the different toasters, was a selection of spreads, including butter, margarine, Vegemite, Marmite, strawberry jam, “breakfast marmalade”, another type of jam, and peanut butter, all in little individual packets. And then … pancakes? I’m not really sure what these were. Is this a New Zealand thing? They sorta looked like pancakes, although not a single one was remotely round, and they were quite large. They also weren’t warm. But they were thick like a pancake, not thin like a crepe. Fascinating. Next to these were two unlabeled bowls, one that looked like it had a syrup, and the other something that was either going to be cream or whipped butter, which you’d think would be distinguishable, but wasn’t. Again, signs folks! 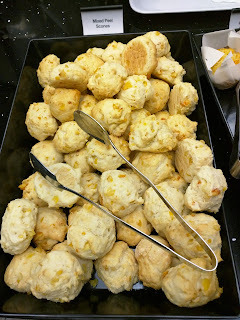 Like the other baked goods, I skipped them on my first journey through the food offerings, but I was too fascinated not to try them, so, I returned when I realized had a few minutes left. I watched to see what others were doing. They all seemed to just take them at room temperature and pour on some syrup. I saw one or two people grab a butter packet and slather that on first. A few people added a bit of the cream/butter? I took one, and ripped of a piece, to try to figure out what I was supposed to do. It really seemed like a pancake, so, I threw one into the conveyor style toaster. It came out a bit warmer, but not really crispy or anything. I think putting it through twice would have made it really nice. I added a little syrup, but really, I was in for the whipped cream, particularly when combined with all the compotes from the yogurt/muesli bar. I loaded my pancake-thing up with the tasty unlabeled compote, stole some of the apricot topping from my muesli pot, and got a very generous scoop of the cream. Awesome. The pancake thing was not particularly exciting, but it wasn’t bad for a pre-made item. The cream and different compotes though … swoon. They were incredible. Totally breakfast appropriate, right? I’m glad I came back for this in round two. Baked beans, scrambled eggs (ketchup on side). A few hot items were in chafing dishes. I skipped the hot items entirely. Chrorizo, potato, & soft herb frittata, Kransky sausages. I wanted to try a sausage actually, but, I was too full. 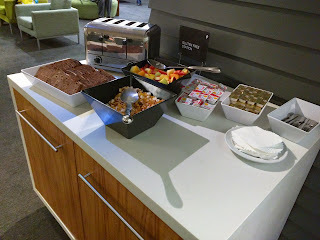 On the side was a gluten free station with sliced fruit bread, fruit salad, muesli, and a dedicated toaster. Kinda sad looking, but, at least they had a gluten-free area, that would be rare in the US. My next visit was at 5pm, which seemed to be right when they were switching between perhaps an afternoon tea service and dinner? I was a bit devastated, because I didn't realize this was going to happen, and took my time settling in before returning to get food, since we had plenty of time. And ... I missed all the tasty looking baked goods that were out for tea time! As before, the gluten-free station was set up with fruit & spice bread slices, chocolate chip cookies, some unlabeled chocolate cake, and fruit salad. Desperate for sweets at the end of my time in the lounge, I tried the chocolate cake-loaf, and it was ok, decent chocolate flavor, dense. 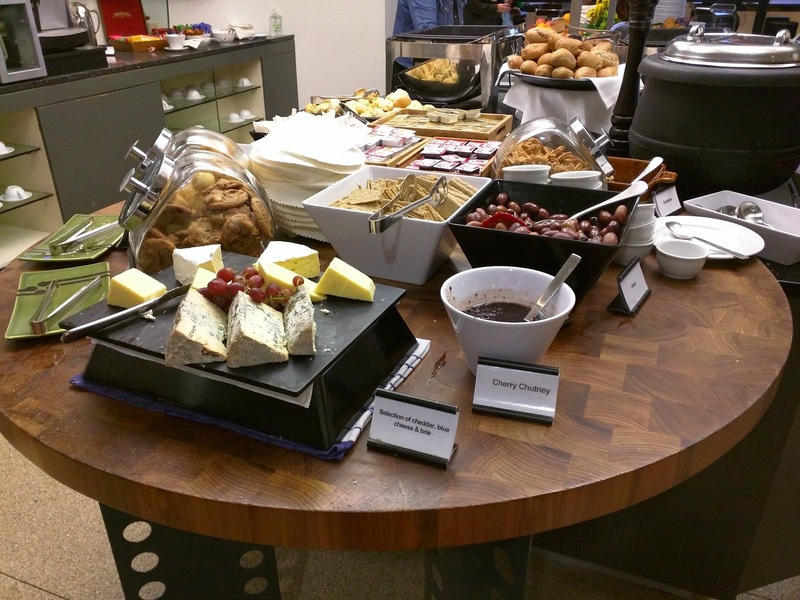 The setup was basically the same as breakfast, starting with fruit. Garden mesclun with tomato and cucumber. Herb roasted potatoes, tarragon, and soft herb mayo. 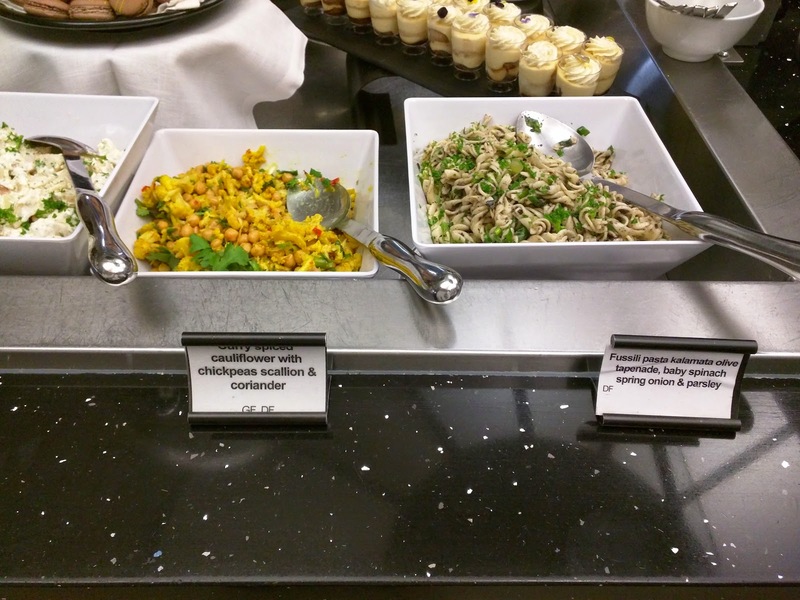 Muesli and yogurt were replaced with salads. Well, this time they had a sign, but it wasn't accurate. I think that is worse. The salad also had green beans and citrus segments, and looked quite fresh. I didn't actually see tomato or cucumber as listed. Non-labelled dressing was on the side, I think ranch. I didn't try this. I went for the potato salad. 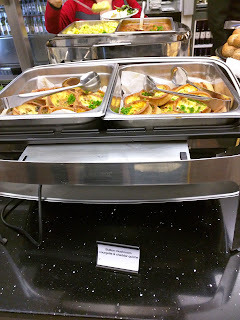 The potatoes were nicely cooked, slight crunch on the outside, soft inside. Not overdressed with a creamy mayo based dressing, lots of herbs. Pretty good potato salad, I was happy enough with it, particularly the herbs. Curry spiced cauliflower with chickpeas, scallion, and coriander. Fussili pasta, kalamata olive tapanade, baby spinach, spring onion, and parsley. Continuing along to more salads, I skipped the curry salad, since it was predominantly chickpeas, which I dislike. I tried the pasta salad. The fussili was decently cooked, but all I could really taste was olive tapanade. Meh. Creamy field mushroom and thyme soup, rolls. Hot selections began with soup. I tried the creamy mushroom soup. It was creamy and had nicely pureed mushrooms, but I didn't care for the flavor. 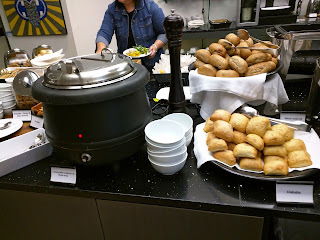 Two types of rolls were served alongside, I didn't try them. Button mushroom, courgette, and cheddar quiche. Just like at breakfast, there were two electric chafing dishes set up, the first with quiche. I never like quiche, so I obviously skipped that. Slow braised beef with cinnamon, tomato, and toasted cumin. Toasted almonds and saffron rice. The other hot option was beef with rice, which I also skipped. Cheeses (cheddar, blue, brie), grapes, cherry chutney, mixed olives, crackers, snacks. At the end was a cheese platter, with cheddar, blue, and brie. The cheeses actually looked decent, but, I wasn't hungry enough to try them. Of course, I nibbled on other things, including the decent enough crackers, dipped in the cherry compote, that was actually pretty tasty. With some brie, that would make a delightful bite! The olive mix was not good though, really, really oily. 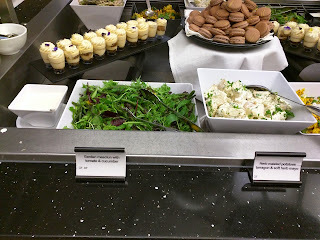 My absolute favorite thing was the little snacks in the jar next to the olives, labelled "Snippets - Honey & Dijon Snacks." I adored these! I love to munch on things, and these were far more interesting than most lounge snacks. Crunchy, hearty, and totally and completely addicting with the honey dijon flavor. I couldn't get enough! Melting moments, Freshly baked milk chocolate chip macadamia cookies. Alongside the cheese and crackers were cookie jars. I don't really like cookies, but ... I wasn't familiar with "Melting Moments", but I'm not one to skip trying a a new dessert! They seemed to be shortbread cookies with a lemon cream filling? Meh. The chocolate chip macadamia cookies were also lackluster, crispy, not buttery. Meh. In the middle of the salad area was other desserts. The little pots were unlabeled, but were clearly tiramisu. 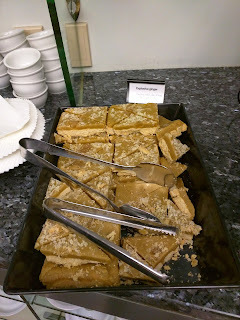 On the bottom was coffee, there were soft ladyfingers, some creamy layer, and whipped cream. And a tiny flower petal. Unremarkable. I didn't try the chocolate macaroons. I needed more dessert, and found these bars over on the side with the tea and coffee. I tried one, mostly due to the name. "Explosive ginger"? Too interesting not to try. The top had crystalized ginger, and was pretty gingery. The next layer was sweet, I can't really describe it. Sugary. Almost like maple sugar candy, but, softer. The base was a cookie base. I liked this and think it would pair amazingly with a cup of tea. 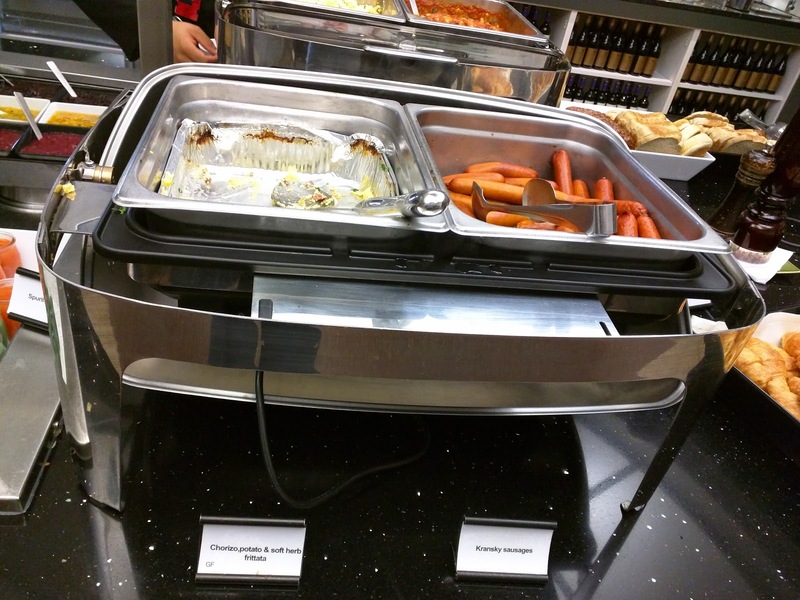 The best thing in the lounge, besides the snacky snacks. 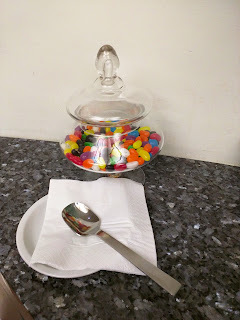 Next to the coffee and tea is also a jar of jelly beans, which was amusingly there at breakfast. They were decent jelly beans, and yes, I had them both times. I really wanted to try the scones, but alas, we were there as they were changing out from afternoon tea to evening dinner, and, they were gone by the time I went back. Doh, that is what I get for taking photos before diving in! Quinoa, apple, and cranberry muffins. 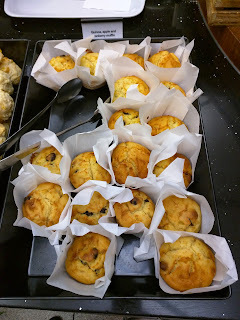 I did manage to snack a muffin before they were taken away like the scones. I really liked the muffins in the Air New Zealand temporary lounge in Sydney, so I assumed the muffins in this full size lounge would be great. Alas, they were not. Strangely moist and gummy, strange flavor. They did have bits of apple and cranberry throughout, I'm not quite sure where the quinoa was, I think it was probably quinoa flour, which is likely what made them so strange tasting. Ah, frozen custard. I love the stuff. I obviously eat a lot of frozen treats, like ice cream, froyo, gelato, etc. I like them all, but frozen custard has a special place in my heart. You don't see it often in the Bay Area, but where I went to grad school in Virginia, it was a thing. For the uninitiated, frozen custard is, well, frozen ... custard. 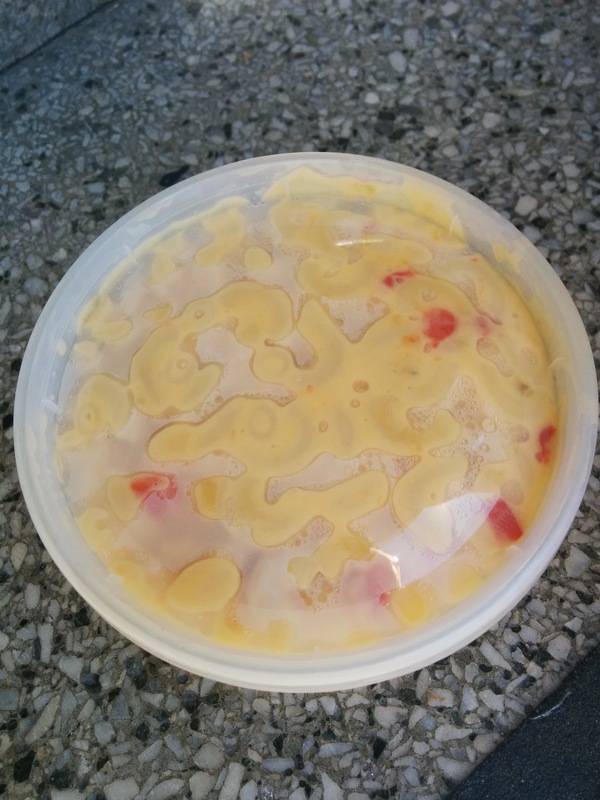 A custard base that is frozen. What sets it apart from ice cream is the egg yolk content, a defining characteristic of any custard. Like gelato, is it generally made fresh and in small batches in shops, rather than commercially, and can be served at higher temperatures than ice cream. It is quite rich due to the addition of the egg yolks obviously, but I find it more pleasantly creamy and soft than traditional ice cream. It turns out, the Bay Area does have one frozen custard operation, a food truck: Frozen Kuhsterd. Well, not quite a food truck, but a mobile stand. 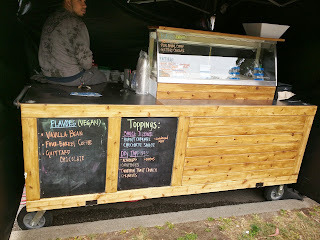 They participate in Off the Grid events around town, and are available for catering. Frozen Kuhsterd has been on my radar before, but I hadn't ever come across their stand until my work group held a picnic in Golden Gate Park, and we got to vote to select our vendors from the Off the Grid lineup. For the savory food, we went for the epic garlic noodles from An the Go, and for sweets, it was Frozen Kusterd. (I swear, I didn't rig the ballot box. I just have ... influence!) Finally, I'd get to try the custard. Of course, we were in Golden Gate Park, so even though it was warm and sunny in the rest of the city, it was totally freezing and cloudy in the park. It wasn't remotely ice cream weather. But, it was my opportunity to finally try the custard, so, I seized the day. The Frozen Kuhsterd station set up under an awing, and rolled out a wooden cart. 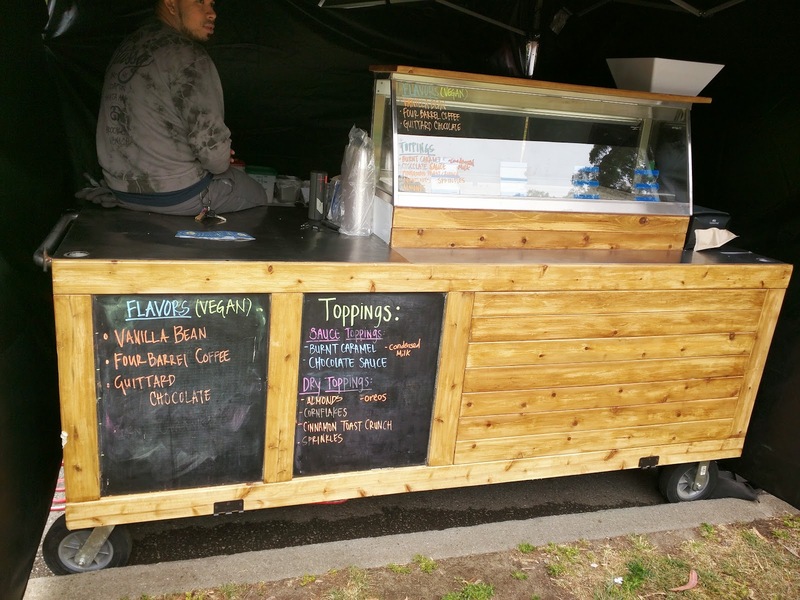 For catering, you have the choice of three flavors of ice cream, plus three liquid toppings, and five dry toppings, all advertised on a chalkboard in front. I did my research beforehand, and eagerly ran up to the stand the moment I arrived to scope it out. Frozen Kusterd is known not only for the fact that they make the only custard in San Francisco, but for their amazing flavors. I knew they offered all the classics like vanilla (and vanilla malt), chocolate (and dark chocolate, and chocolate malt), strawberry (and port wine strawberry), coffee (and white coffee), cookies n creme, chocolate chip, rum raisin, etc, but also some very fun tempting flavors such as peanut butter and jelly, salted chocolate peanut butter, black sesame, cheesecake, maple butter, kettle popcorn, ube, and even the questionable salt and pepper potato chip or sweet corn. And that is just the standard flavors! 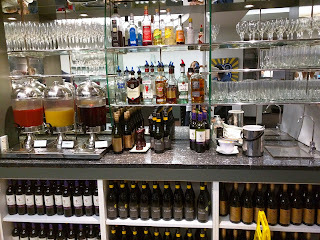 They also offer premium selections, many boozy, like coffee mint mojito, fresh mint white chocolate, matcha white chocolate, spiked cereal milk, pumpkin cheesecake, spicy pumpkin chocolate pie, red velvet cake batter, banana rum, and yuzu sake. Thus, I was fairly disappointed when I saw our menu. Vanilla bean, Four Barrel Coffee, or Guittard Chocolate. I guess the event planner was trying to please the crowd, but, those are pretty much the most boring flavors ever. I also researched toppings before showing up. Frozen Kuhsterd is known for some ridiculous pairings, like ice cream sandwiches using sliced Dynamo Donuts as the "cookies". OMG. Or sundaes built on a foundation of sweet potato fries, bacon waffles, or funnel cakes. Toppings can be chunks of bread pudding or boba. Did I mention, OMG? Our toppings however were more ... tame. For sauces we could select from burnt caramel, chocolate sauce, or condensed milk. 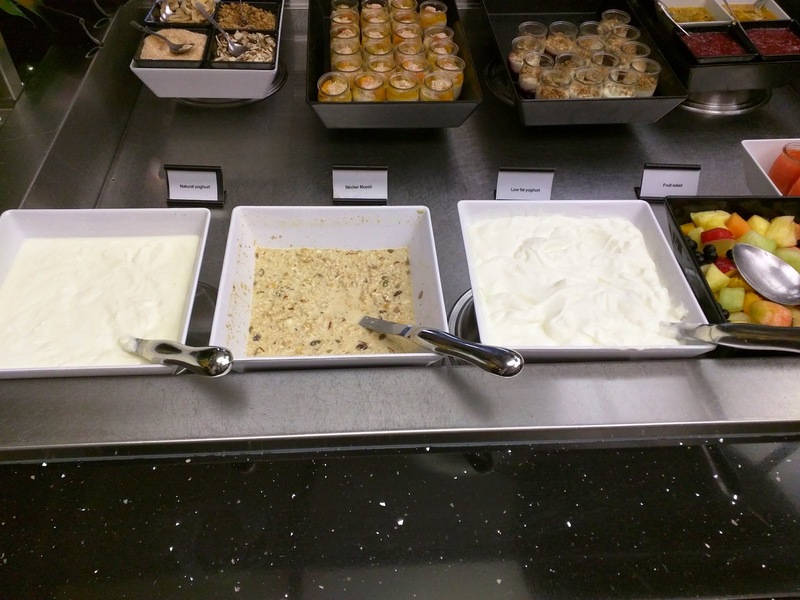 Dry toppings were almonds, cornflakes, Oreos, Cinnamon Toast Crunch, or sprinkles. A little deflated, I stepped up to order. 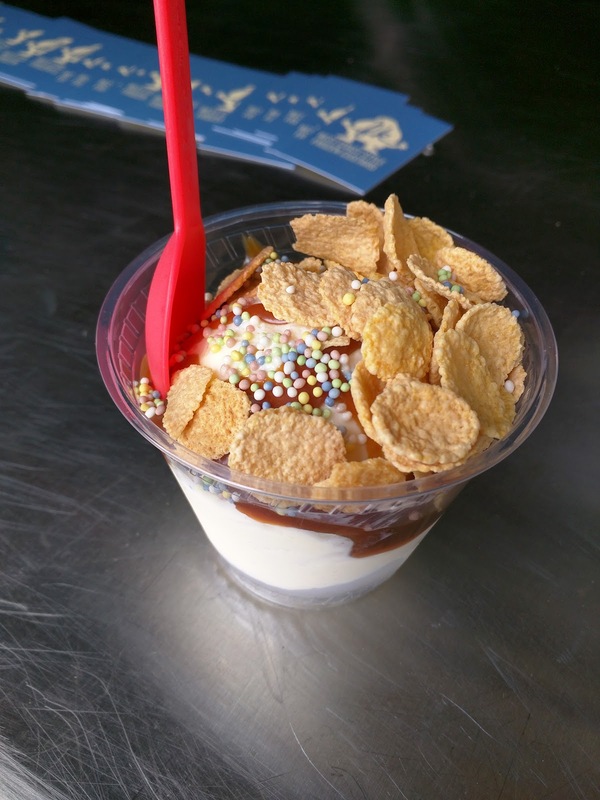 Cinnamon Toast Crunch Custard, Burnt Caramel, Cornflakes, Sprinkles. I had to rule out the coffee flavor immediately due to the caffeine. 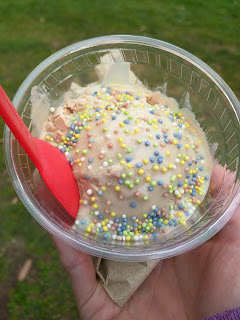 I also rarely really like chocolate ice cream (I know, I'm weird), so, vanilla it was. I figured I could spruce it up with toppings at least. I was the first person to opt for vanilla, since, well, it is vanilla. When the server went to scoop it, he gave it a funny look. He pulled out a sample spoon. He tasted it. "That isn't vanilla", he said. My heart skipped a beat. Yes! Something more exciting! It turned out to be Cinnamon Toast Crunch flavor. I went for it, even though I could kinda care less about Cinnamon Toast Crunch. Still, better than vanilla, right? It had a very, very slight cinnamon flavor, but was mostly just sweet. I think they were going for the cereal milk concept popularized by Momofuku Milk Bar. But for me, the flavor fell flat. 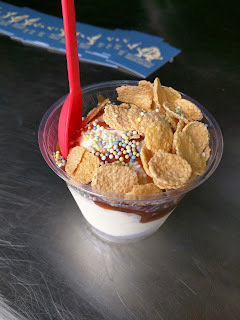 I asked for topping recommendations, and the scooper suggested burnt caramel sauce and cornflakes, so I took his suggestion, and added sprinkles for fun. The burnt caramel sauce was warm, which was nice. It was a thin style, not thick. But it was just way too sweet for me, and I didn't pick up any subtle burnt flavor. Caramel, not burnt caramel. The sweet cereal milk base with the sweet sauce didn't really work, I needed some contrast. I agreed with his suggestion for cornflakes, even though I didn't really want them, but I knew I'd want some crunch. They were, well, cornflakes. Ojan really liked that component, but I didn't see why I'd ever want cornflakes on my ice cream. The sprinkles turned out to be the little ball kind, rather than sticks. I actually like these more, since they add a bit of crunch too. They were cute and colorful, the best part of my creation. As you can tell, I was pretty let down by my treat. I kept taking more bites, hoping for it to grow on me, and finally realized that I just truly didn't want more. I rarely don't finish a dessert, but my heart just wasn't in this at all. I gave it to Ojan, who also didn't want it, who gave it to another friend. It still went unfinished. After I warmed back up, I stepped up to try again. Guittard Chocolate, Condensed Milk, Sprinkles. Since I couldn't have the coffee flavor, that left one choice: the Guittard Chocolate. I know Guittard's products fairly well, and was happy to see that Frozen Kusterd uses a local chocolate maker for the chocolate. The flavor was very mild, not a rich, deep chocolate. But it was creamy, smooth, and really quite nice. I liked it far more than I expected. I also wanted a sauce, and since I didn't really like the caramel, and didn't want more caffeine from the chocolate sauce, I opted for the final option, condensed milk. It was sweet, creamy, milky, and not what I'd ever think to put on ice cream, but it totally worked. A unique offering for sure. And of course, more sprinkles. Overall, this was far more successful, and, even though I was freezing, it disappeared. I also tried a bite of my coworker's creation of chocolate with chocolate sauce and Oreo. His was clearly the best, the chocolate components all worked together nicely. Still, I have no reason to return for anything I tried. I was glad to have finally tried Frozen Kusterd, and would certainly still like to try some of the more interesting creations, but their basics were just that: basics.